In the garden of good and evil, it sure is nice when something good just falls into your lap…or inbox, in this case. 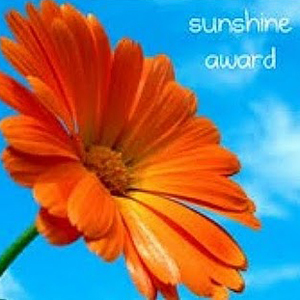 I’m delighted to accept the Sunshine Blogger Award from Sam of CheeeseToastieandVideoGames! She’s a badass game blogger in her own right, so you should totally check out her site for plenty of gaming awesomeness. Okay, now for the 10 random facts. This should be, well…I’d say “interesting,” but I guess that’s up for you to decide. 1. In another life, I worked as a seamstress. This led to jobs in various theatres, clothing stores, and a leather consignment shop. 2. I’ve been doing yoga for several years. It’s the only thing that gets me up in the morning. Well, that and coffee. 3. I’ll only eat eggplant in eggplant parmesan, and I’ll only eat cauliflower in curry. And I just can’t like broccoli rabe, no matter how hard I try. 4. My gaming has always been somewhat seasonal, but it’s even more pronounced now that I’m a homeowner. From March to November, house needs take priority over games. 5. Still, I continue to buy games, especially older ones that I never played, to add to my ever-increasing backlog. 6. I recently went through a mid-life fashion crisis in which I banished all my graphic/novelty t-shirts. They are going to be made into a quilt. 7. I can no longer bring myself to buy white shoes. Too much maintenance to keep ’em looking nice. 8. I love museums, but especially car museums. I could spend days looking at restored/preserved cars. 9. After a decade of avoidance, I’ve finally accepted shorts back into my life. 10. If I could meet one person, alive or dead, it’d be Jim Henson. Delver — a great blog from a savvy writer. He looks at games, life, and everything in between. Phoenix Down — one of my now go-to blogs for gaming news. And she’s a great storyteller! Games I Made My Girlfriend Play — as someone who’s part of a gaming couple, I can relate to many of the stories here. Love the dash of realism among all the entertainment! Find the Blue Key — straight up opinions on games and gaming wrapped up with a dash of humor. What more could you ask for? Space Giraffe?! — He’s a giraffe…IN SPACE. If you don’t want to follow the awesomeness he serves up…well…you might be dead inside. Turn Based Living — one of my newer follows, this blog run by two brothers, is great to read and helps demystify game design for those not in-the-know. Wrong Button — everything to make geeks and gamers happy! And if you think their blog is wonderful, you should totally listen to their interviews on Incoductic and At The Buzzer. A Most Agreeable Pastime — how I missed a Victorian-themed game blog, I’ll never know. But I recently started following these guys — delightful and witty gamers they are! And because this is my blog, I’m also going to nominate my co-horts at United We Game, The Duck of Indeed and Hatm0nster of My Two Caps. Their blogs have certainly been an inspiration to me and I’m happy to have them as blogging colleagues. Is that it? I think that’s it. Back to blogging! 6 hurts my heart because of my soft spot for graphic/novelty tees myself, however I’m in the same boat (ish). Not so much a mid-life fashion crisis but just realizing how boss I could look without wearing the Shirt.Woot shirts that I love everyday. Also 7! I never buy white shoes! I don’t know why the exist! Who can wear white shoes without constant upkeep!? My mind can’t fathom. Anywho, glad you got nominated, your content certainly fits in this category of inspiring and excellent! I think the last time I had a pair of white shoes was in high school — I needed them to go with the white (ugh) graduation robe. Since then, no thanks. You’re very welcome. Wonderful work on Phoenix Down and best of luck with your new venture, GaminG4Respect! Thanks much for nominating me! I’m nominating you back, and my own post about the award will be up in a little bit. Woohoo!